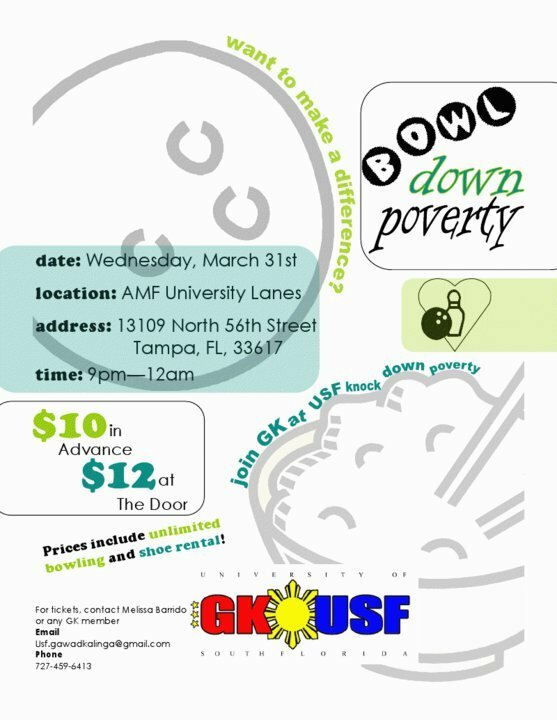 You can make a difference in the lives of the poor by joining the members of GK at USF as we bowl down poverty! Come out for a night of fun and games for a great cause! All proceeds will benefit Gawad Kalinga (GK) at USF and our mission to take action against poverty. GK at USF is a newly formed student organization that is driven and inspired by the movement of Gawad Kalinga. GK is a growing global army against poverty and has already built over 1,800 villages for the poorest of the poor in the Philippines and other third world countries. For more information about Gawad Kalinga, please visit http://www.gk1world.com and register online for the monthly newsletter. The members of GK at USF believe that our generation has what it takes to “Be the change (we) want to see in the world.” We invite you to make a difference in the lives of others by refusing to pass on a world of poverty and suffering to the generations that will come after us. No matter who you are or what your background is, you can be an ordinary person doing extraordinary things. GK is a movement larger than life and you can be a part of history. There was a tie reported last week in the student body elections for USF Student Body President so they were planning on having a run-off this week which has now been canceled and turned into a general election. Personally I hate the idea of runoffs or just re-voting because the initial voting group doesn’t come back out (because of time or lack of knowledge about it since it’s usually really close to the original election) and numbers just go down so it may not be as effective.